If sitting at a desk is part of your day to day life, whether working or studying, whether in an office or at home, you will certainly need some desk side beauty essentials on hand in case of an emergency! I keep my essentials pretty basic so they don't take up too much space on my work desk; I don't want it to start looking like it's come out of a beauty salon after all (it probably wouldn't impress my boss either). Here's what I have on my desk at the moment. This stuff is just brilliant and is the perfect size for putting in your handbag too. The gel is amazingly hydrating so you don't have to apply hand cream if you're in a rush. The lavender scent is quite strong when the product dispenses from the tube, but once it's absorbed it's lovely and fresh. This is a fairly big bottle, but I like it because of the quick'n'easy pump dispenser; no having to fiddle around with lids and squeezy tubes here! It releases just the right amount of product so you can massage it in and go. 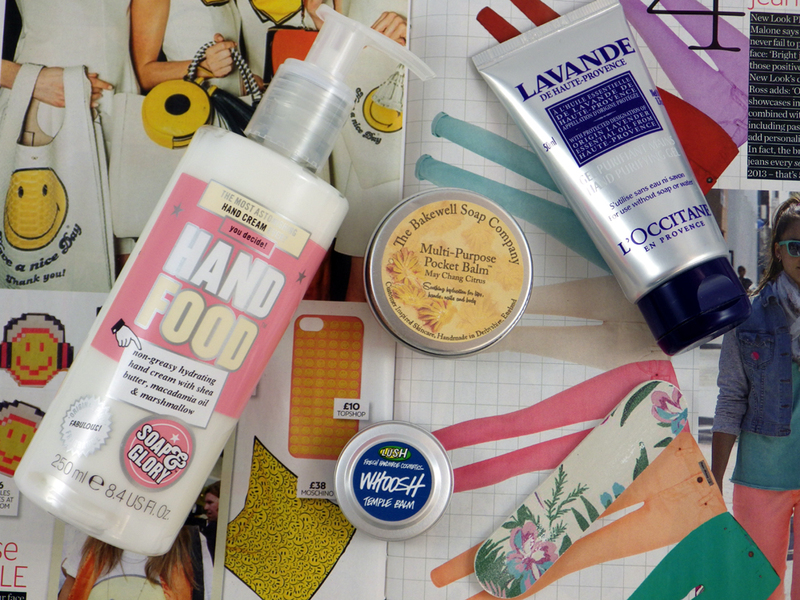 It's the sort of hand cream that is nice all year round because it's hydrating but not too thick, with the standard Soap and Glory scent that never gets boring. 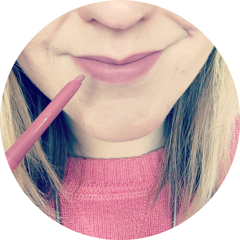 I absolutely love a multi-tasking product and this citrus scented, hydrating balm is packed full of natural ingredients to relieve dryness on the lips, hands, nails and body. It's not something to use on large areas (it's a solid balm so not as easy to apply), but if I have dry lips, ragged cuticles or any small patches of dryness on my hands/face/body, I'll use this. I picked this up in Lush's Boxing Day sale after being intrigued by the concept - you apply to your temples to perk you up and focus your mind when you're feeling tired and overworked. The scent definitely is invigorating; a mixture of reviving lemon, lime, grapefruit, rosemary and geranium. I tend to apply it on my wrists too. This is really a short term solution and not going to do a lot if you only got a few hours sleep the night before, but for that general 3pm slump it certainly helps. This particular one came in a H&M nail kit I bought. I always like to have a nail file handy because once I feel any uneveness or scags on my nails I just have to file it, otherwise it irritates me for the rest of the day. Being small it doesn't take up much space either! What are your desk side essentials? I didn't know you could get Hand Food in that size! I go through the squeezy tubes like mad!